What’s A Rising Sign and Why Should I Care? 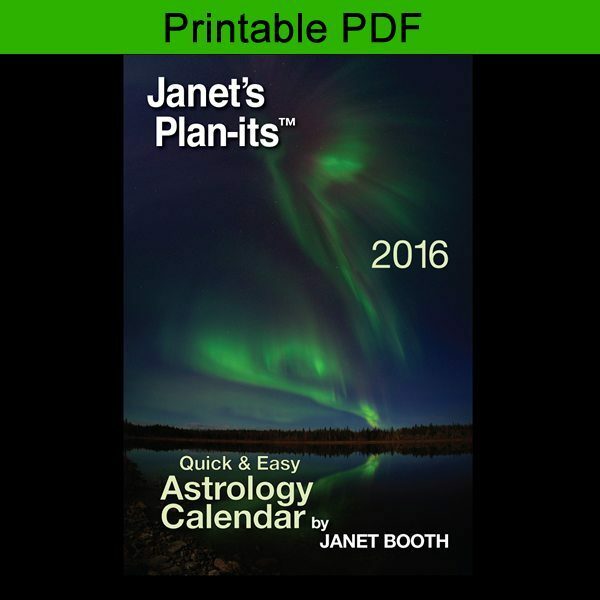 Expert astrologer’s interpretation of the planets’ influences daily, weekly and on a longer-term basis, regardless of a person’s sign. Recommendations for favorable times for various activities. Formatted for printing on 8-1/2″X 11″ paper. This version of Janet’s Plan-its is suitable for any computer or device that can read PDF files – most can! It is formatted to print 8-1/2 X 11 pages, if you so choose. There are 131 pages. The beautiful cover is not part of this file and there are no hyperlinks to websites. (For that feature, get the longer PDF file; however, it is not paginated for nice printing). Completely spam-free. Opt out any time. 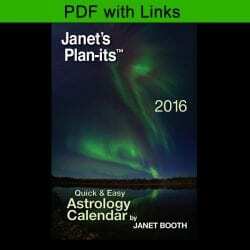 Receive Janet's free occasional eNewsletters with information about current or upcoming astrological phenomena, as well as special offers on services and products. (You can unsubscribe any time.) These are different from her blog articles. For those, sign up separately above. 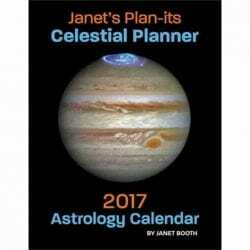 Show your appreciation for all of Janet's free information!